“This year I’m designing for 8-13 year old males with excessive gaming problems. My aim is to provide a gaming alternative that provides the same thrilling experiences without comprising the health of the user. To do this I’m combining two up-coming technologies, virtual reality gaming and remote control drones into a product that I call Maverick. 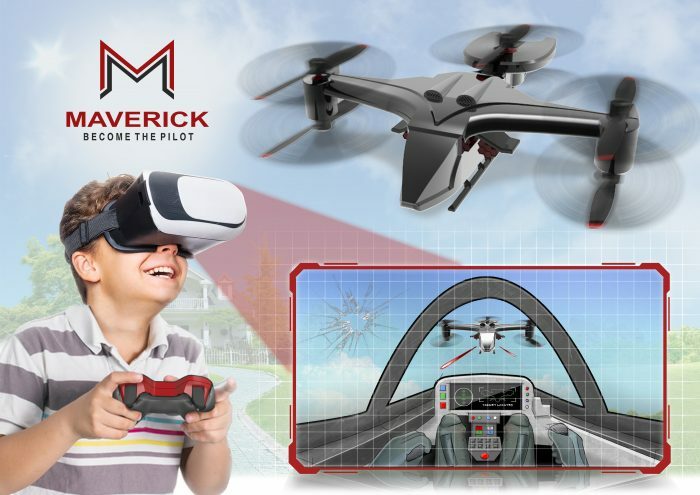 Maverick is a drone with a camera located in the cockpit, so when the player puts on a virtual reality headset they are essentially sitting in the pilot’s seat. These drone’s can battle each other using infra-red laser technology similar to laser-tag, which is completely invisible and harmless to the user’s eyes. Can you tell us about your inspiration? This entry was posted in Design and craft, Graduate Show, Graduates 2017, Product design, Undergraduate and tagged Disney, Drones, Gaming, Maverick, product design.